"I had to fight my way up, and now I'm here." Oscilloscope Labs has unveiled the first official trailer for an indie documentary titled Wrestle, from co-directors Suzannah Herbert & Lauren Belfer. This doc has been winning awards all film festivals all over: Best Alabama Film and Spirit of Sidewalk Award at the Sidewalk Film Festival; Special Jury Mention at the Woodstock Film Festival; Best Sports Feature and the Audience Award at the Hot Springs Doc Film Festival; and the Maysles Brothers Award for Best Documentary at the Denver Film Festival. Wrestle is an "intimate and nuanced" film following the wrestling team at JO Johnson High School in Huntsville, which has been on Alabama's failing schools list for many years. As they fight their way towards success at the State Championship, wrestlers Jailen, Jamario, Teague, and Jaquan, each face injustices and challenges on and off the mat. This has been described as the Hoop Dreams of wrestling. Hoop Dreams goes to the mat in this intimate, coming-of-age documentary about four members of a high-school wrestling team at Huntsville’s J.O. Johnson High School, a longstanding entry on Alabama’s list of failing schools. Coached by teacher Chris Scribner, teammates Jailen, Jamario, Teague, and Jaquan each face challenges far beyond a shot at the State Championship: splintered family lives, drug use, teenage pregnancy, mental health struggles, and run-ins with the law threaten to derail their success on the mat and lock any doors that could otherwise open. Tough-love coach Scribner isn’t off the hook, either; he must come to terms with his own past conflicts while unwittingly wading into the complexities of race, class and privilege in the South. Director Suzannah Herbert and Co-Director Lauren Belfer captured over 650 hours of footage during the course of the team’s final season to create this closely observed, deeply affecting depiction of growing up disadvantaged in America today. 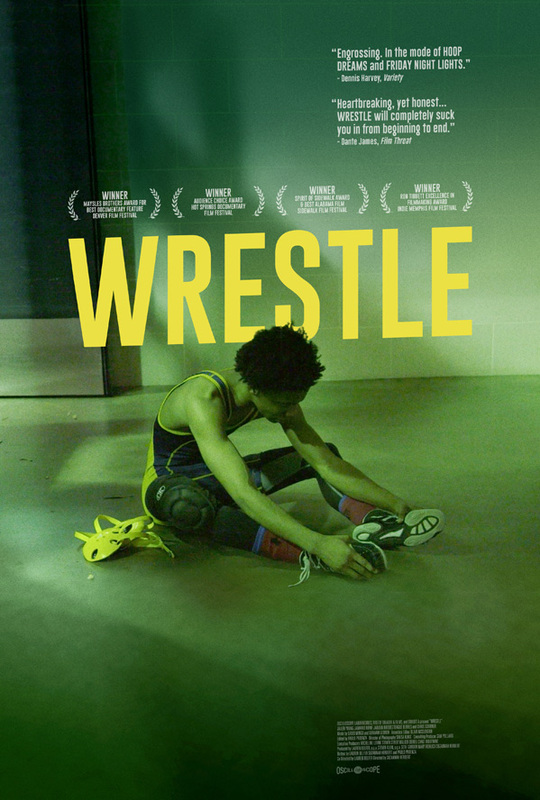 Wrestle is co-directed by filmmakers Suzannah Herbert & Lauren Belfer, both making their feature debut after working in various producing / editing / development roles previously. This premiered at the San Francisco Film Festival last year, and also played at the Denver Film Festival. Oscilloscope Labs will release Wrestle in select theaters starting February 22nd.